Front page story in The Oz today: Shorten unveils tax and spend ‘cure’. Bill Shorten will claim the most significant reforms to Medicare since it was created by Bob Hawke in 1984, with a $2.3 billion expansion of bulk billing to cut out-of-pocket expenses and provide free services for cancer patients. Outlining a big-spending ­agenda, the Opposition Leader also promised to restore $1bn in TAFE funding to meet critical skills shortages while revealing he would match the Coalition’s tax cuts for 10 million people and ­provide bigger tax refunds for a further 3.6 million workers earning less than $48,000 a year. The government seized on Mr Shorten’s budget reply speech last night, claiming Labor could not be trusted to deliver on its promise because of a record of financial and economic mismanagement. Whatever Labor promises, they will do, and then some. They will steal from everyone to the maximum extent, and then wonder why real wages and household incomes are falling. 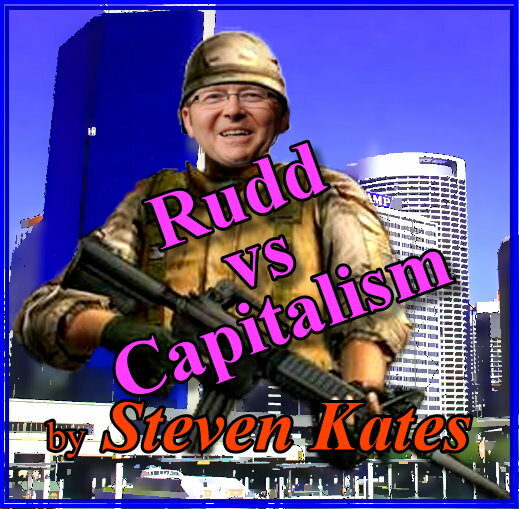 This is what I wrote back in 2009 about Kevin Rudd, as he launched Labor’s last venture in tax and spend. It was a long article from Quadrant – where the photo above is from. It should be a reminder of the mentality that lies behind whatever the ALP might like to pretend on the surface. Near on forgotten as well are the Costello years of budget surpluses and ZERO debt. Labor thereafter drove us into our present predicament since they have never understood how an economy works, only how to squeeze whatever they can from out of the productive to finance idiocies like school halls, pink batts and the NBN. ECONOMIC INCOHERENCE ALERT: There I was, minding my own business, quietly eating my lunch while reading the paper, when what should I come upon was this: Negative bond yields revive fears of secular stagnation. From The Financial Times in London reprinted by our own AFR. It is astonishing how economically ignorant our present generation is. Having watched the stimulus provided around the world after the GFC create only additional harm, these morons continue to plough the same furrow since they know nothing else, and cannot learn from what is right before their eyes.